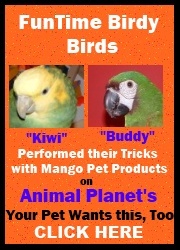 Your bird can wish upon his own personal shooting star and have his wish come true every day. Our parakeet "Snowy" loves to chew and tug at all the small plastic chains on this brightly colored toy. Bird toy measures 9" long from top of pear link to bottom of plastic chain and 2 1/4" wide. Shooting Star Bird Toy5FrankieOctober 15, 2012Fun fun fun toy!!! I love the chains; they are fun to pull and tug on, and I have even tried climbing them! Mom hung this toy up on my playgym, and I just love it!! !